The Dawn mission to Vesta continues to release an image every day, and recently they have been releasing lots of color images. I like color pictures for aesthetic reasons, but color is actually a very important property of planetary surfaces. Color, and how it varies across a planetary surface, provides many pieces to the puzzle of that planet's history, and learning how to read those clues from those colors is one of the things they teach wannabe planetary scientists. Here's one recent example. If the caption doesn't make much sense to you, don't worry -- that's why I'm writing this blog entry. Grab a snack. It takes me a while to explain. Many of you may be wondering what they mean by "ratio" and probably also what the heck a "ferrous absorption band" is. I'm going to try to explain! First things first. Space cameras are not like the one in your phone or point-n-shoot pocket camera. Space cameras usually have detectors that can detect light across slightly more of the electromagnetic spectrum than human eyes can see, from near-ultraviolet to near-infrared wavelengths. More importantly, while the pictures that they take are often pretty, they are not intended to be for snapshots; they are sophisticated, precise scientific measuring devices. Each tiny pixel in a space image is a carefully calibrated measurement of how many photons reached the camera, and for Dawn's Framing Camera, there are a million pixels in each image, a million careful measurements of how much light different spots on Vesta's surface reflect. To get information on the color of a planetary surface, Dawn's camera team -- like those on Voyager, Opportunity, and Cassini, among many others -- added a filter wheel to the front of their camera. A filter is like a gel on a theater light. It turns white light into colored light. It does this by limiting the wavelengths that can pass through the filter. So a "red" filter typically permits only red wavelengths to pass through, but not blue or green or ultraviolet or infrared, and an "ultraviolet" filter permits only the shortest wavelengths of light to pass through, but not yellow or red or infrared. When you put a filter in front of the camera, the picture you get is a measurement that corresponds to how many photons from a limited range of wavelengths hit the camera's detector. Each pixel is recorded as a number; pixels with higher numbers received more photons. 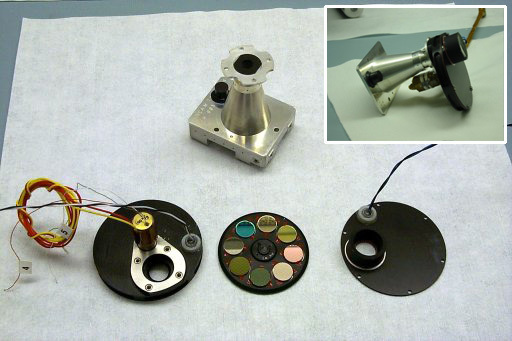 Here's a photo of one of the Mars Exploration Rover Pancams, taken apart so that you can see the filter wheel. It's a wheel because it can rotate to different positions to place different filters in front of the camera lens. Dawn's Framing Camera has eight different filters fairly evenly spaced across the part of the spectrum that its CCD is capable of detecting. This graph shows what happens when white light (light with a broad mix of wavelengths) is shone through Dawn's different filters. The "F1" filter, or clear filter, lets the white light pass directly through. The left image in the pair I posted above was taken using this filter. All the other filters let only narrow slices of wavelengths of light through. Copied from this poster about the Framing Cameras. For short, rounder numbers are used to refer to these filters. For example, they call it "750" instead of "749." 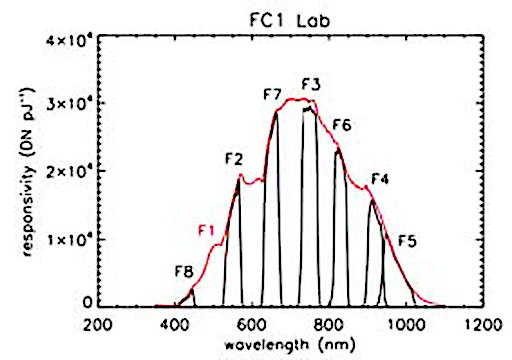 Among the filters, there are three that roughly correspond to wavelengths detectable by the color-sensitive cone cells in human eyes. These are referred to as red, green, and blue. But there are four filters in longer, near-infrared wavelengths. Why? Each of the lines on this graph is a "spectrum," a plot of how reflective is a spot on Mars with increasing wavelength. The black line is a representative spectrum from White Rock itself. The green line represents the dark sand on the crater floor near White Rock. The blue line is an olivine-rich spectrum from Meridiani planum. The red line is a spectrum rich in iron and magnesium-bearing clay minerals from Meridiani Planum. All the spectra bear similarities. They all have a strongly upward slope from 0.4 to 0.7 microns, the visible range, which gives all of them the overall red color that is common to Mars. All have a dip near 1 micron, indicating the presence of iron; the White Rock, crater floor, and mafic spectra also contain a much smaller dip near 2 microns, indicating that the iron and magnesium is found in a mineral called pyroxene. The clay spectrum has noticeable dips at 1.9 microns (indicating that water is bound in the chemical structure) and 2.3 microns (indicating the presence of hydroxyl, OH- groups, another signature of the presence of water). Although White Rock bears some similarity to the clay spectrum, it does not contain those two dips, so there is no clear evidence for the presence of water. Spectra are very meaningful to spectroscopists, but for the rest of us, they're just squiggly lines; looking at them, I might as well be trying to read Japanese. Nearly every rocky body in the solar system has a "red slope," meaning that it's brighter in red wavelengths than it is in blue wavelengths, and true color pictures look reddish-brownish. But some things are redder than others. In the spectra above, you can see that the red squiggle, representing clay minerals, is MUCH more reflective at 750 nanometers than it is at 440, giving that line a steep slope, while the blue squiggle has a lower slope. So if you divide the 750-nanometer image by the 440-nanometer image, your resulting image is brighter where stuff is relatively redder, and darker where stuff is bluer. The image has become a map containing spectral information, so you can read a million spectra at once. Furthermore, all of the confounding changes of brightness and darkness due to shadowing have been eliminated, because shadowing darkens all wavelengths equally, so the ratio remains constant. So if you take the 750-nanometer image and divide it by the 920-nanometer image, you get a map that shows you where olivine is more abundant (it's brighter) and where it's less obvious (it's darker). In fact, you can just hand this image to a geologist and say that it's probably brighter where there's more olivine or where the surface is fresher and darker where there's less or it's older, and the geologist doesn't have to know a thing about spectroscopy to be able to read some information from the map. Usually, for planets and moons and asteroids that have no atmospheres, it is observed that redder surfaces have been exposed to space longer than bluer surfaces. 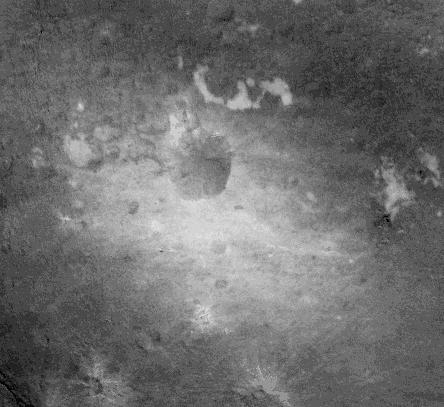 Old cratered plains are often redder; fresh crater rays are often bluer. So redness is often used as a proxy for age. So it's really weird to me that half of the spray of ejecta from the crater Numisia in Dawn's image is showing up as appearing red in this false color image. 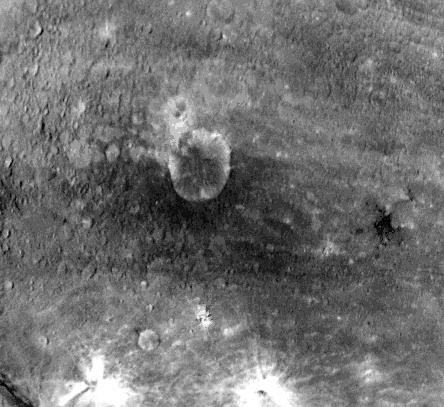 Maybe that's not actually ejecta? And those blobby orange deposits above Numisia are interesting, too; they're spectrally different somehow (that they are orange suggests that they are both red and relatively olivine-rich or relatively fresh; "red" and "fresh" don't usually go hand-in-hand). All of this will help Dawn's science team map out the composition of Vesta, and tell a story about its history -- a story that looks like it will be quite different from, say, the Moon's. I'm looking forward to reading that story!